In the first Star Wars movie, there is a dearth of female characters. Obviously, Leia Organa is the most prominent female character, exhibiting confidence and strength equal to her male companions, making her a rarity in the era she was conceived. But beyond Leia, we have only Aunt Beru and a few female cantina denizens. Both the Galactic Empire and Rebellion appear to be devoid of females entirely. Much of that changed as the trilogy unfolded and in Return of the Jedi, it was revealed the Rebellion was led by Mon Mothma, the enigmatic former Senator. The prequel trilogy did a better job of depicting strong females, the most prominent of course being Padme Amidala, mother of twins Luke Skywalker and Leia Organa. There are also a few female Jedi and bounty hunters introduced in the prequels. Fast forward to today and the last two Star Wars movies featured strong female leads in Rey and Jyn Erso. The Star Wars comics took a similar path as the movies. 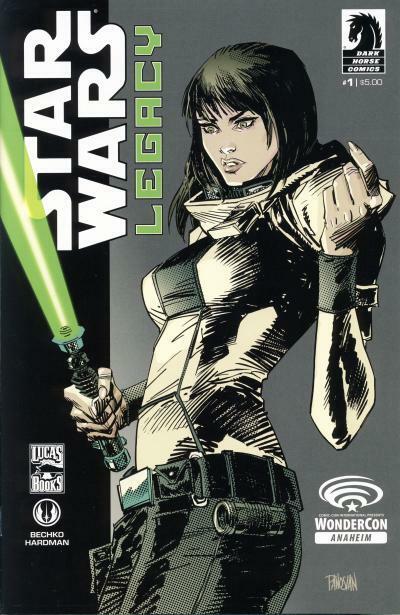 The most significant female character introduced in the original Marvel series is Luke's companion Shira Brie, who is revealed to be an Imperial agent and after a near death incident, is reborn as Lumiya. The only other female character of prominence is the Zeltron Dani, who is introduced along with Rik Duel and Chihdo as part of Rik's gang. Both female characters are introduced after The Empire Strikes Back adaptation. Dark Horse had the benefit of time and used several female characters introduced in other media, like Mara Jade from the Timothy Zahn books, Asajj Ventress from the Clone Wars animated series, and Aurra Sing from the movies among several others. They also introduced female characters of their own, including Nomi Sunrider from the Tales of the Jedi series and their most significant female character, Jedi Knight Aayla Secura. 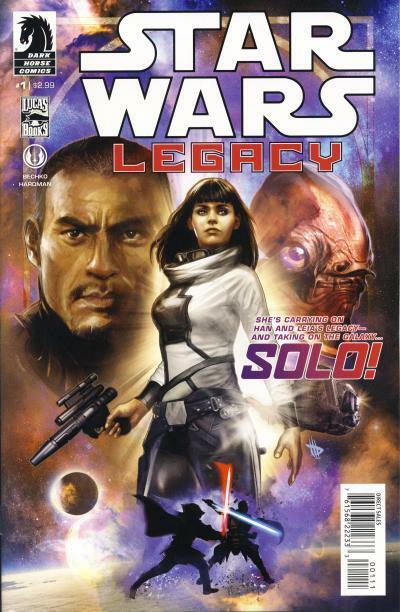 In 2013 Dark Horse introduces Ania Solo, a prototype of sorts to Rey and Jyn Erso and the lead character in the second Star Wars: Legacy title. Ania Solo is a decedent of Han and Leia Organa Solo. When we are introduced to Ania, she is a junk dealer based on a moon of Carreras Minor in the Outer Rim, not unlike Rey on Jakku in The Force Awakens. Additionally, her backstory includes her escaping from an Imperial prison camp, just like Jyn Erso in Rogue One. And just like the two movie characters, Ania is swept up in the galactic conflict of her era. Even Ania's look bears a striking resemblance to the heroines of The Force Awakens and Rogue One. It is easy enough to imagine a brunette British actress playing her in a movie. 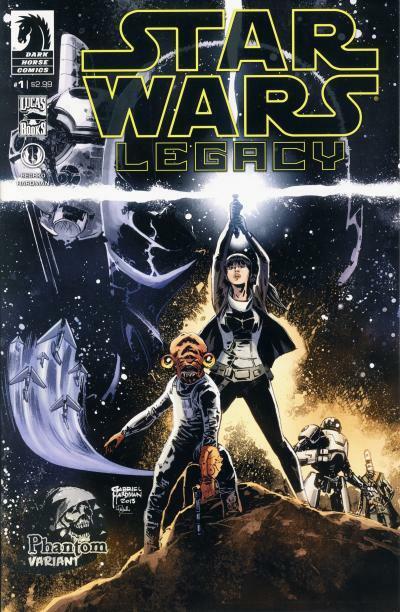 Star Wars: Legacy #1 has an exclusive Phantom variant. The Phantom program, led by Larry Doherty from Larry's Comics, has commissioned several exclusives that are distributed through participating retailers. The Phantom variant cover artwork is a homage to the Tom Jung/Hildebrant Brothers poster. There is also an exclusive cover sold at the Wondercon Anaheim 2013 event. The Star Wars Celebration 2017 took place in Orlando, Florida from April 13 - 16. Tate's Comics locate in Florida had an exclusive Star Wars: Rogue One #1 cover for the event. 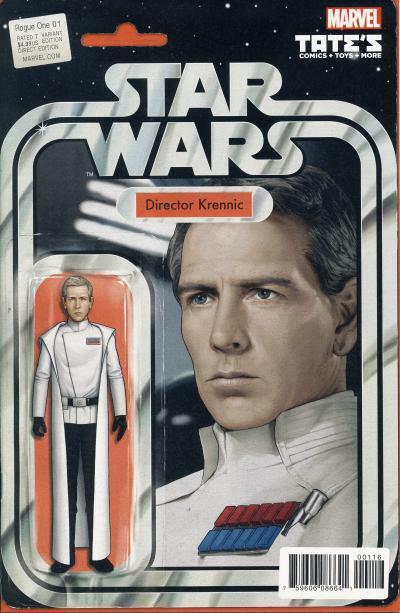 The Director Krennic action figure art is by John Tyler Christopher, who has provided the artwork for all the Star Wars action figures covers to date. This is Tate's Comics 3rd Star Wars exclusive cover and their first from Marvel. 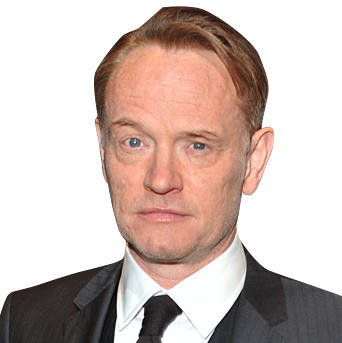 When I first saw the art for the AT-AT Commander action figure cover to Star Wars #30, I thought the character looked a lot like a young Jared Harris, best known for playing the reserved Englishman Lane Pryce on Mad Men. 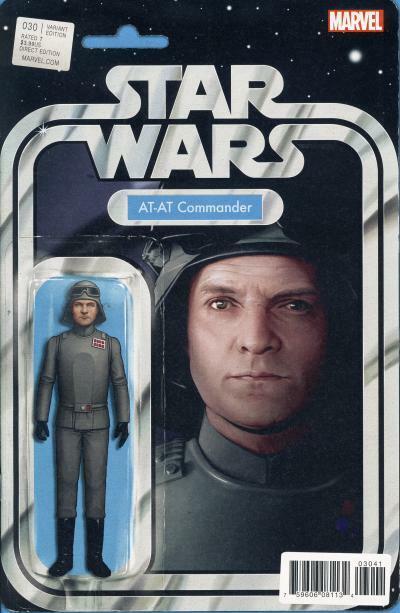 Despite the similarities to Jared Harris, the action figure cover is taken from a photo of the actual actor who portrayed General Veers, Julian Glover. Julian Glover recently played Grand Maester Pycell on the Game of Thrones. The Walt Disney Company is a vast media and entertainment conglomerate that acquired Marvel Comics in 2009 and Lucasfilm in 2012. When the Star Wars comic license was awarded to Marvel in 2015, nobody was surprised. What has been surprising, however, is how few Disney exclusive comics have been published in the Star Wars line in the two and a half years Marvel has held the license. 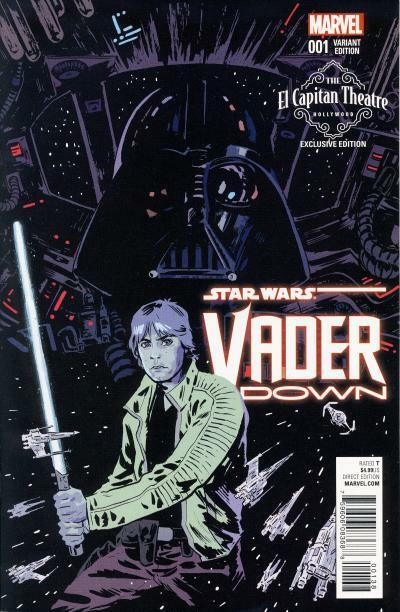 Despite having amusement parks, stores, and other outlets for selling comics, Disney has only had four Star Wars exclusives, all for the Star Wars: Vader Down #1 one-shot. In comparison, the number of exclusive Star Wars toys sold at their parks is enormous, ranging from static figurines, to Droid Factory action figures, die-cast action figures, plush characters, and more. One can only imagine when the Star Wars-themed expansion opens in the Disney parks, even more exclusives will be introduced and maybe there will be a comic or two in the offering. In January 2015 Star Wars #1 was released with 71 different covers and went back to print 6 more times bringing the total number of covers to 77. And that is not including additional cover artwork published by Panini Comics! The next modern Star Wars comic to have a large number of covers is Vader Down #1 with 44 variant and exclusive covers! The Vader Down story arc was released during the buildup to The Force Awakens premiere, which helped contribute to the fervor. Several Disney outlets had exclusive covers to offer at the time. The Disney Parks exclusive is an image of Darth Vader holding his lit lightsaber while Rebel troops amass in the background and X-Wing Fighters fly overhead. I am not sure if this comic was actually distributed at Disney Parks, but it was sold at the online Disney Store. Built in 1926, the El Capitan Theatre in Hollywood at first showed live plays, but by the 1940s, it began screening movies. In 1980, Disney acquired the theatre which they renovated and began using for Walt Disney Studio film premieres. The El Capitan Theatre showed The Force Awakens from December 18, 2015 through February 7, 2016. Movie goers who purchased the VIP comic book admission would get a reserved seat, popcorn, drink, and one of two Vader Down #1 El Capitan Theatre exclusive comics. 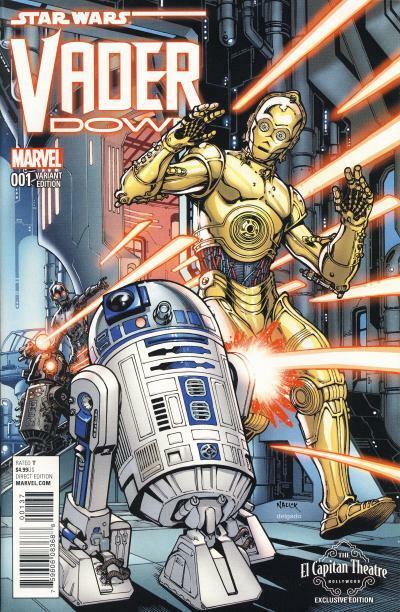 Cover A shows C-3PO and R2-D2 being fired on by BT-1 with 0-0-0 no doubt urging him on. Cover B is a montage with Luke Skywalker standing ready with his lightsaber and an image of Darth Vader piloting his TIE Fighter. Surrounding Luke are several X-Wing Fighters attacking Vader's TIE. Next to the El Capitan Theatre in Hollywood is the Disney Studio Store & Ghirardelli Soda Fountain and Chocolate Shop. 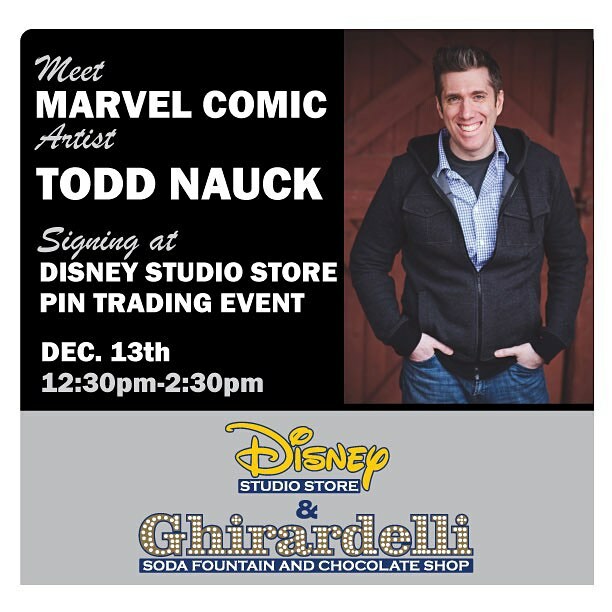 On December 13, 2015, Todd Nauck attending the Disney Studio Store Pin Trading Event at the location and signed an exclusive black and white variant of the C-3PO and R2-D2 cover that El Capitan Theatre had in color. All of these comics are easily found. The Disney Parks and El Capitan Theatre exclusives list for $10 to $20 on eBay. The Disney Studios Store & Ghirardelli Soda Fountain and Chocolate Shop exclusive is usually $100 to $125 in NM condition. 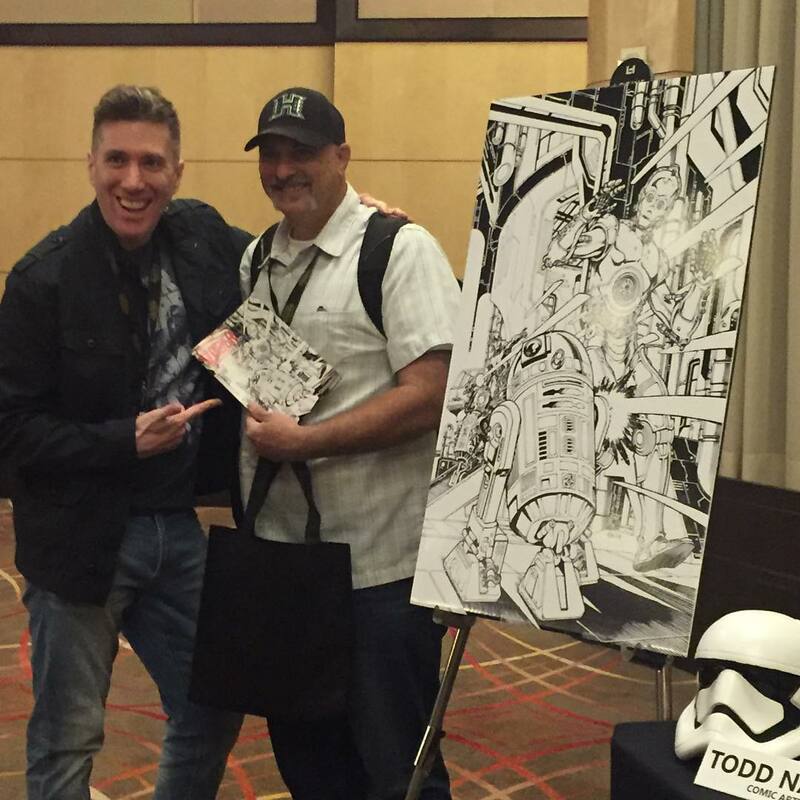 Most of the copies are signed by Todd Nauck, but a few copies did make it out unsigned. This was the last cover for the Vader Down #1 I acquired to complete the set since I held out for a copy without a signature. 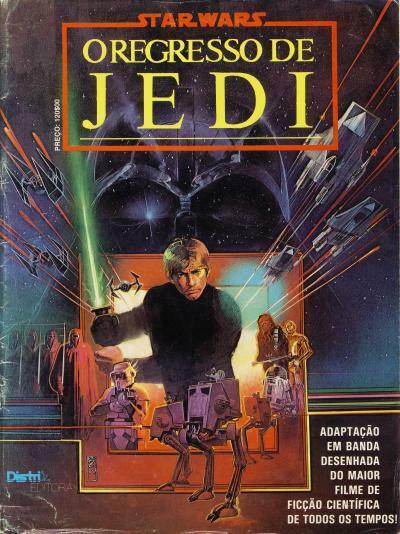 Distri Editora published a translation of the Return of the Jedi adaptation for Portuguese readers in 1983. The magazine is very similar to the U.S. Marvel Super Special #27 including the back and front cover art and the paper quality of the cover and interior color pages. The inside covers are blank. The title is simply O Regresso de Jedi. The indicia is located on the back cover of this magazine instead of the interior. The cover for this magazine format is easily damaged due to the slick nature of the paper and the use of only two staples. It is not uncommon to see Marvel Super Special issues with the covers detached at one or both staples. Finding a nice condition copy of a magazine using this format from a country with a relatively small population like Portugal (in 1983 there were less than 10 million people) is not an easy task. Despite the rough condition of the copy I own, the cover is firmly attached at both staples. Dino Verlag published Star Wars comics in Germany from June 1999 until it was acquired by Panini Comics in 2003. 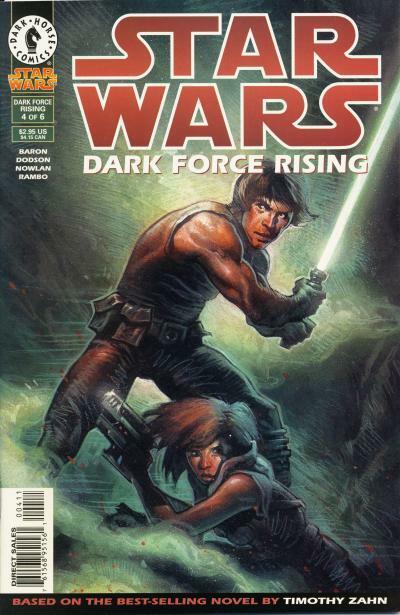 The Dino name continued to be used on the Star Wars comics until January 2007 and afterwards the Panini name is used. 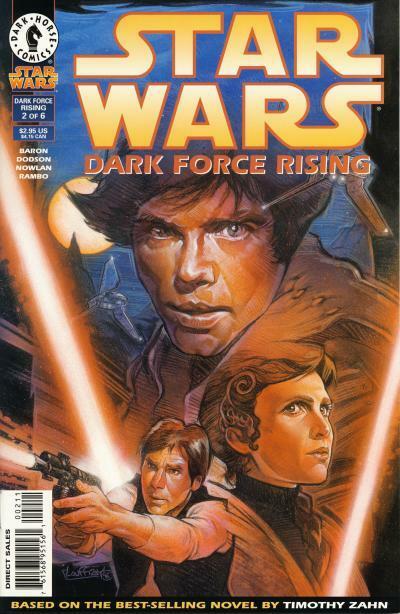 The main Star Wars title ran for 125 issue from June 1999 to September 2015. It contains a variety of Dark Horse titles translated for German readers. 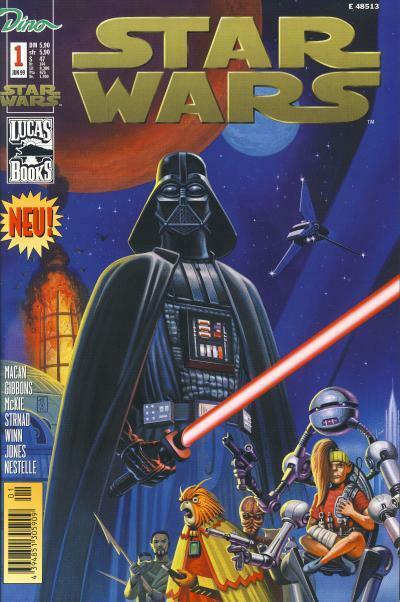 Dino Verlag's Star Wars (1999) #1 contains German translations of Dark Horse's Star Wars: Vader's Quest #1 and Star Wars (1998) #1. 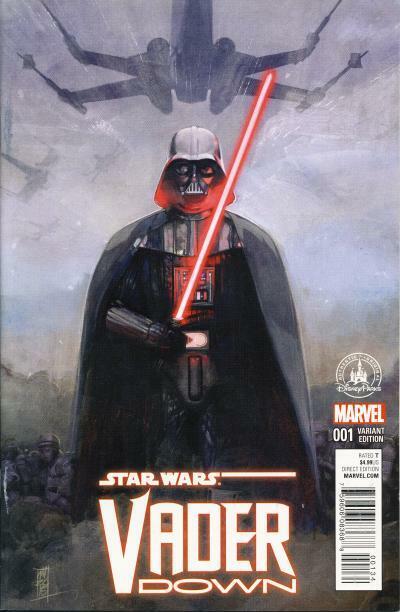 The cover used is from Star Wars: Vader's Quest #1. Princess Leia: All this time, while we've search for him... not even the Empire knowing where he was... Vader had him... and was doing... this. Ellie: Look at... what is left of him. Do you think that saving his life would be a kindness? He was... a very great trouble to the Empire, many times. Do you think Darth Vader left him alive... as a kindness? As she finishes, Ellie hands the tapes to C-3PO. Luke, Leia, and C-3PO depart the cell at Ellie's request and cradling Vanis' broken body, Ellie self-destructs. Luke and Leia blow up the castle and contact Admiral Ackbar letting him know they have recovered the tapes. The final panel shows C-3PO standing in the rain looking like he is crying. The story is powerful, showing just how evil the Empire is and how cruel Vader can be. These types of stories are essential to reaffirming the Rebels as heroes and not a group of terrorist. After Vader's horrible treatment of Vanis, it is hard to believe Luke feels he can redeem him in Return of the Jedi! The Bothan tapes Luke and Leia recover are for the second Death Star. Later on, the Expanded Universe tells a different story about how the tapes were obtained and eventually both stories are reconciled as occurring in continuity. 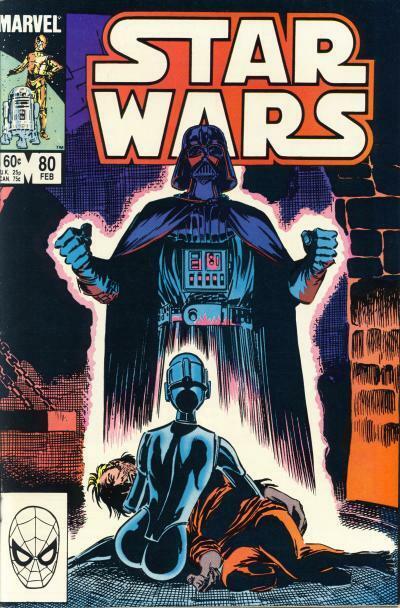 The scene on the cover for Star Wars #80 combines two elements of the story, the holographic image of Darth Vader and Ellie holding Tay Vanis. It is one of my favorite covers of the original Star Wars run. The positioning of Vader over a portion of the title makes it look like he is wearing a Nazi helmet with the spike on top. The cover for Titans #81 does not match the story inside. On the cover, Luke is wearing his Bespin fatigues and Leia is dressed in her A New Hope gown. Inside the comic, both are wearing the green outfits they wear on Endor. The main movie characters from the story are all present on the cover and in the story Luke does strike down several Stormtroopers with his lightsaber. Also, Leia has her hair in buns on the cover and inside, something that rarely occurs in the comics after The Empire Strikes Back. The Titans #81 cover art does not capture the emotional impact of the story and I could not recognize the story from this artwork. Additionally, the painted work is decent, but not nearly as nice as some of the other French covers. On the other hand, the U.S. cover captures the essence of the story. Bantam Spectra published Star Wars books from 1991 to 1999, starting with Heir to the Empire, the book that helped revive Star Wars and kick off the Expanded Universe. Del Rey won back the license with plans to shaking up the status quo. Bantam mainly published stories that involved the New Republic battling the remnants of the Empire. Del Rey's first publishing efforts after The Phantom Menace adaptation was a massive nineteen book story called the New Jedi Order. Involving multiple authors, the story centers around the original trilogy characters as well as characters introduced during the Bantam era. The story introduces the Yuuzhan Vong, an alien race from another galaxy, intent on taking over the galaxy the New Republic had consolidated and was stabilizing. During the course of the story, both Chewbacca and Anakin Solo are killed off. The novels sold extremely well, although the story is not embraced by some fans who feel it sways too much from a traditional Star Wars story. 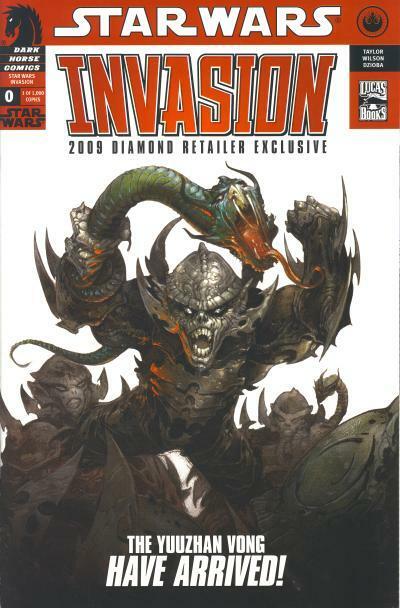 Interestingly, the invasion story was suggested by Randy Stradley, Vice President of Publishing at Dark Horse. Despite Dark Horse's initial involvement in shaping the story, Dark Horse chose not to publish any comics pertaining to it during the 4 years the novels were being released although they did seed the invasion by introducing Nom Anor in the Crimson Empire II mini-series. Nom Anor is an advance scout of the Yuuzhan Vong, intent on sowing discontent in the galaxy. 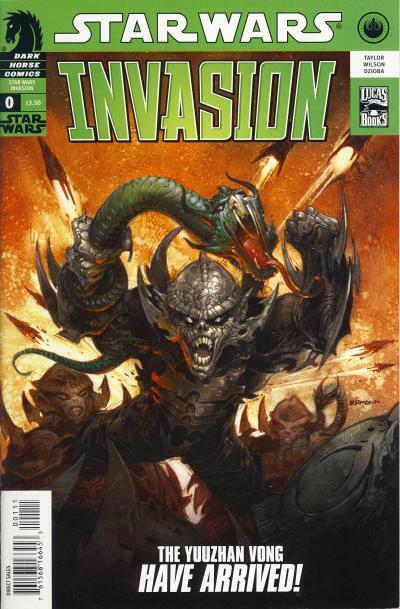 Six years after the final book, The Unifying Force, was published, Dark Horse released a 6 issue mini-series titled Star Wars: Invasion. The first issue of the mini-series, #0, tells the story of two explorers at the edge of the galaxy who intercept a transmission from the first planet in the galaxy attacked by the Yuuzhan Vong invasion force. They successfully warn the nearest planet Artorias of the approaching armada before making the decision to ram their spacecraft into one of the Vong ships, killing both explorers. Afterwards, there is a brief one page introduction to the royal family of Artorias who become the focal point for the remainder of the series. We also learn it is a strategically placed Yuuzhan Vong advance scout that received the message and the planet's inhabitants will not be warned of the approaching fleet. An exclusive cover was given to retailers at the 2009 Diamond Retailer Summit in Baltimore, Maryland. The artwork was modified to have a solid white background behind the Yuuzhan Vong. Additionally, the logo and other cover artifacts are changed from green to red. Below the title is text that reads 2009 Diamond Retailer Exclusive. Finally, the price has been replace with text that reads 1 of 1,000 copies. At one time, despite being limited to 1,000 copies, this comic was frequently seen on eBay for $20 - $25. These days, with the renewed interest in Star Wars due to Disney releasing new movies yearly and Marvel owning the comic license, many of the Dark Horse variants and exclusives have become scarcer on eBay and prices have been going up. The official Star Wars site has another exclusive to report. Marvel is publishing the one-shot titled Star Wars: Rogue One - Cassian & K-2SO. The story will show how Cassian Andor and K-2SO met. You can read more over at the official Star Wars site in the article CASSIAN MEETS K-2SO IN ROGUE ONE PREQUEL COMIC – EXCLUSIVE!. The Comics Chronicles released the April 2017 estimated sales last week. The top selling book on Diamond's Top 300 chart was Marvel's summer event kickoff book, Secret Empire #0. Five issues sold over 100,000 units, an improvement over only two issues in February and two in March. The main Star Wars title continues to impress. Again, in April, it was in the top 10 in 8th place and it remains Marvel's top selling ongoing title. The main Star Wars title saw a standard downward drift in units sold. With this title participating in the Screaming Citadel crossover event next month, I expect a decent jump in sales. This title saw an increase of almost 17,000 units for the Vader Down event back in November 2015. It is not unreasonable to expect an increase of 10,000 to 15,000 units. Both Doctor Aphra and Poe Dameron saw a significant slip of around 4.5% in units sold. These numbers for Doctor Aphra have to be disappointing for Marvel and this is only the sixth issue! Doctor Aphra will be saved, at least for a while, by the Screaming Citadel crossover event next month. It will be interesting to see how big of an increase it will receive. While Poe Dameron #13 is not the lowest selling issue for an ongoing series, it is very close. The Rogue One adaptation debuted with over 64,500 units sold. In comparison, The Force Awakens #1 sold over 79,500 units or roughly 15,000 more units. Regardless, Rogue One still took 13th place on the charts whereas The Force Awakens was in 20th place. As mentioned for the past few months, Darth Maul is selling roughly the same numbers as the Obi-Wan and Anakin mini-series. Nothing has changed this month. Next month, we get the debut of the Screaming Citadel event! There have been a number of articles in the past month concerning Marvel's lagging sales compared to a year ago. All of the attention has been on the superhero titles and the causes and remedies needed bring those numbers back up. It is plain to see that the Star Wars line of comics has also suffered from whatever is ailing Marvel and, to a certain extent, the entire industry, which is why I'm not entirely sure some of the remedies being bandied about are going to really have a long term effect on sales. Marvel has a new series this summer titled Generations which will lead to them bringing back their classic heroes and original numbering in an event titled Marvel Legacy. I could be wrong, but to me this feels like more of the same; a Marvel event followed by renumbering a large number of titles in their line, except this time they are going to number the titles to where they would be if they hadn't kept rebooting the numbering over the years. No doubt this will give Marvel another reason to reboot titles in the future with a new #1. Naturally, this event will boost Marvel's superhero line, but for how long? I cannot be the only Star Wars collector who is feeling burnt out on the number of ratio'd variants Marvel publishes for these titles. Marvel, please stop the ratio'd variants! Publish variants, but don't limit them and give every fan a chance to buy them. If you want to sell more books to fans, why make it hard for them to buy your product? Additionally, at least for the main Star Wars title, the recent Yoda story arc was dull. To be honest, I also think Doctor Aphra's first story arc was weak, but I know this character has a lot of fans who are willing to give the title a chance. We need to see a return to some decent stories like the main title had up through the Rebel Jail story. Everything after that has been lackluster with a few exceptions. One thing that the Star Wars line has that Marvel's superhero line does not is mini-series. Marvel has recently said the Star Wars line is the only place the mini-series format sells. I'm glad to hear this as most of these mini-series have been pretty good. The Lando, Han Solo, and Darth Maul mini-series are some of the best stories to come out of this era of Star Wars comics. The following table shows the total number of Star Wars units sold per month since January 2015 along with the average number of sales per issue. The average sale per issue of 54,852 would rank 23rd on the top 300 chart for the month of April. Star Wars trade paperbacks, reprint titles, and reorders are not accounted for with these numbers. The Star Wars trade paperbacks are strong sellers. Take a look at the Star Wars Sales Estimate Chart and please read the blog posting April 2017 comics sales estimates: Beyond Marvel's slow start, rest of industry growing. The official Star Wars site is reporting that Marvel will publish a 5-issue mini-series titled Star Wars: Jedi of the Republic — Mace Windu starting in August 2017. Recently Marvel has been delving into the prequel era and the current Darth Maul mini-series is shaping up to be one of their best stories yet. A Mace Windu led story during the pivotal Clone Wars has a lot of potential. You can read more over at the official Star Wars site in the article MACE WINDU GOES SOLO IN NEW MARVEL COMIC – EXCLUSIVE!. The Comics Chronicles released the March 2017 estimated sales back on April 10th. The top selling book on Diamonds Top 300 chart was Amazing Spider-Man #25. What makes it noteworthy is the retail price of $9.99 for 96 pages. Due to the success of that book, expect to see more Marvel comics priced at $9.99. Star Wars placed in the Top 10 in 7th place with 72,017 units sold. Like February, only two comics shipped over 100,000 units. This months numbers are fairly standard. The three ongoing Star Wars titles saw a standard drift downward in the number of units sold compared to last month. The main Star Wars title is the best selling of the titles. A year ago, Star Wars #17 sold over 107,000 copies; Star Wars #29 sold one third fewer copies in comparison. The Doctor Aphra title did not drop as much as last month, so hopefully this title has stopped the bleeding. A year ago, Darth Vader #18 sold over 80,000 copies, so Doctor Aphra #5 sold almost half as much. It does not surprise me Marvel is relaunching the Darth Vader title since this spin-off title has sputtered out of the gate. I expect Doctor Aphra to get a huge boost from the Screaming Citadel event, but whether or not the title can hold onto the gains it will receive is anyone's guess. Poe Dameron is now selling around the same numbers that the Kanan title had when it was cancelled. As expected, Darth Maul #2 had roughly the equivalent numbers to the Obi-Wan and Anakin mini-series for its second issue. Since it appears to be following the same trajectory, the final issue of this mini-series should finish around 50,000 units. Next month, the Rogue One movie adaptation debuts. The average sale per issue of 53,650 would rank 21st on the top 300 chart for the month of March. That is a very respectable number, especially when you consider Marvel only had 5 issues sell more than this in March. Star Wars trade paperbacks, reprint titles, and reorders are not accounted for with these numbers. The Star Wars trade paperbacks are strong sellers. Take a look at the Star Wars Sales Estimate Chart and please read the blog posting Retailers order 114,000 Amazing Spider-Man #25s, most expensive comic ever to top charts. 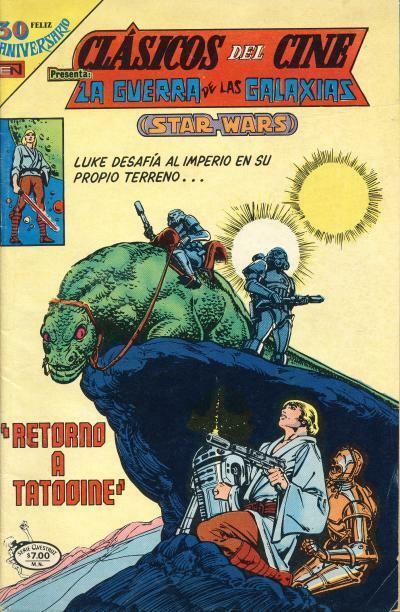 Editorial Novaro began translating Marvel's Star Wars in their Clásicos del Cine or Film Classics title starting with issues #299. The first four Star Wars issues in the title are in the smaller sized aguila or eagle format. Starting with issue #303, the format was changed to the avestruz or ostrich format which are standard sized issues. 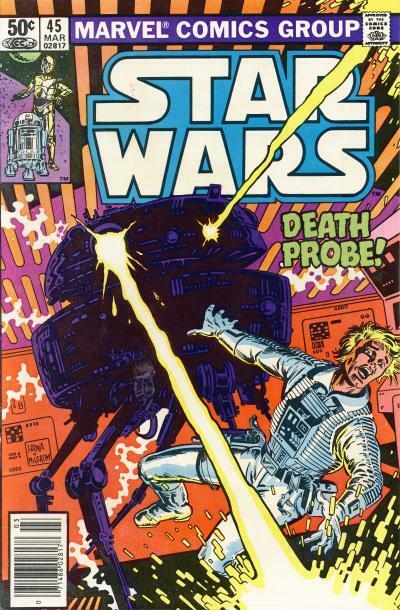 The title ended with issue #315 and Star Wars was published in every issue from #299 - 315. When the title ended, the Star Wars translations were moved to Novaro's Domingos Alegres title starting with issue #1427 where they would appear every four issues alternating with other features until that title ended with issue #1457. The Star Wars issues in that title are all in the aguila format. Clásicos del Cine #315 is the final issue in that title. In the upper left hand corner of the cover it says 30 Feliz Aniversario or Happy 30th Anniversary. This marking was used on several covers throughout Novaro's comic line to celebrate the 30th anniversary of the founding of the publisher by brothers Luis and Octavio Novaro. Editorial Novaro ceased publishing comic books only five years later in 1985. 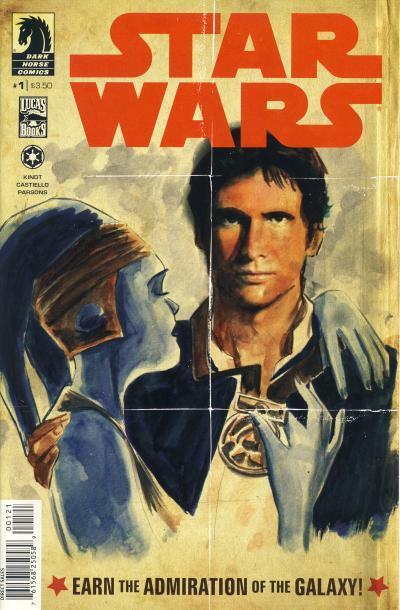 The artwork used on the cover is the same used on Star Wars #31. 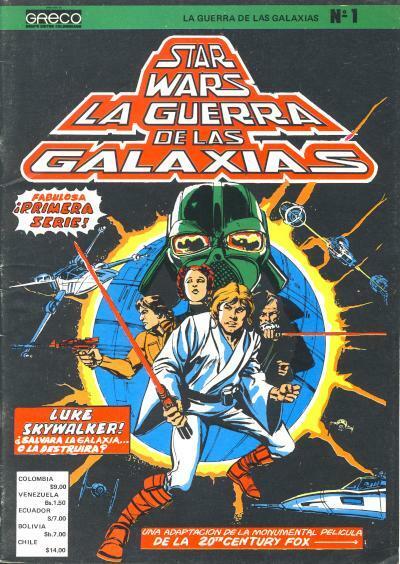 All the Star Wars issues use the Spanish La Guerra de las Galaxias and, in parentheses, the English Star Wars on the cover. In the earlier years of Dark Horse's tenure with the Star Wars license, they adapted the first original Star Wars books, Splinter of the Mind's Eye and Han Solo at Stars' End to comic books. They also adapted the first books of the new era, Timothy Zahn's The Thrawn Trilogy. 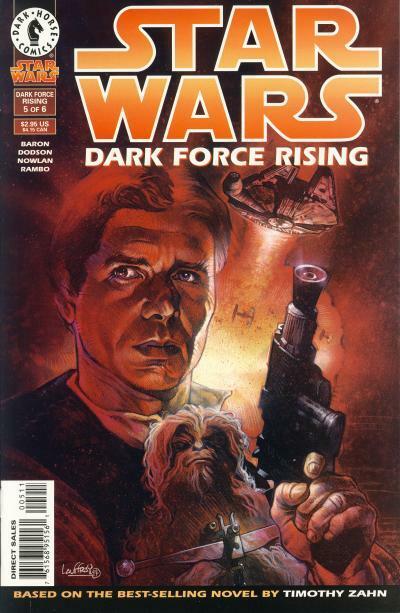 The first 6-part mini-series was based on Heir to the Empire and every issue was the top selling Star Wars comic for the month they were published. Even more impressive, each issue was in the top 25 comics sold the month they were released! With these strong numbers, it only made sense that the second book was adapted as well. 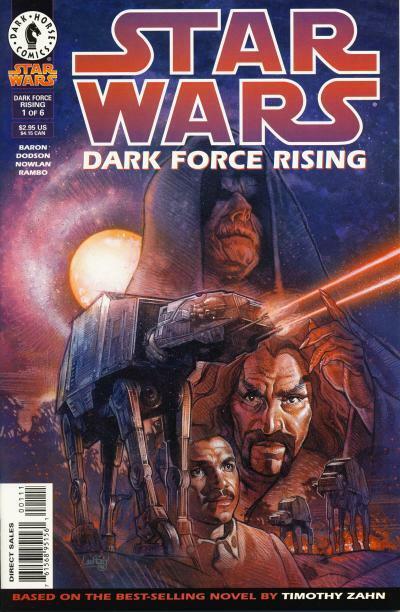 Also a 6-part mini-series, Dark Force Rising #1 was published in May 1997. 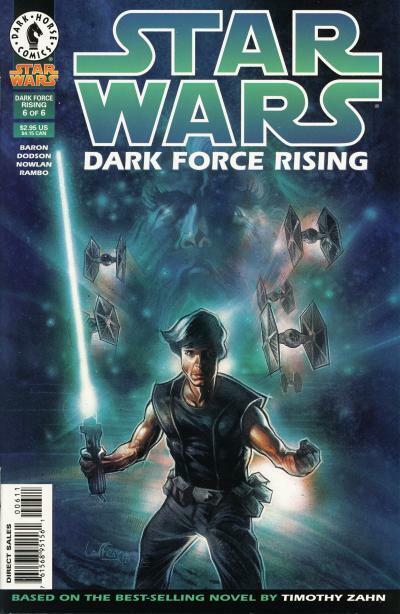 Despite being the top selling Star Wars title for the months it was published, Dark Force Rising never cracked the top 25 list. The cover art is provided by Mathieu Lauffray who also did the cover art for the first mini-series. But, instead of using the original French artists for the interiors, the artwork was penciled by Terry Dodson. 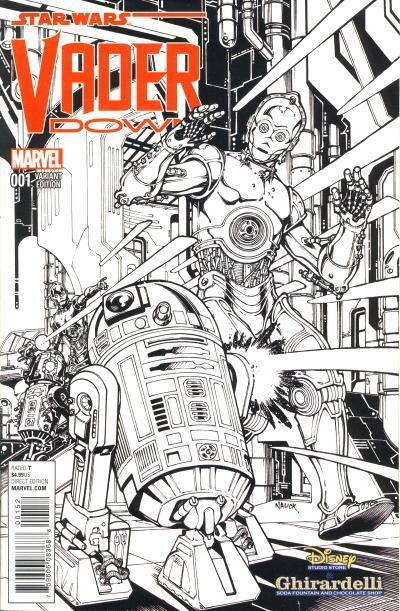 Dodson should be familiar to modern Marvel comic fans, as he provided the artwork for the Princess Leia mini-series as well as numerous variant covers for the Star Wars line. 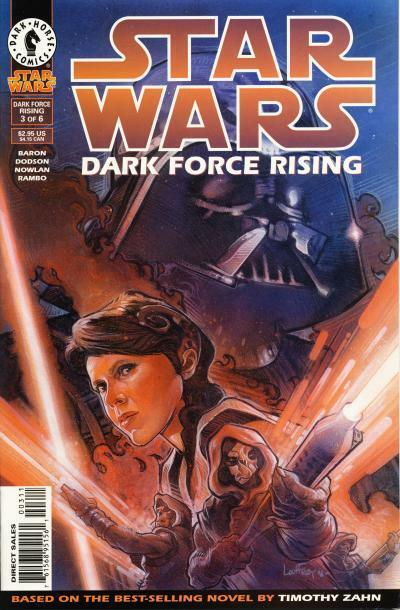 Heir to the Empire has very stylized European art whereas Dodson brought a more traditional U.S. comic style to Dark Force Rising. If you are reading the mini-series back-to-back, the change in art style can be jarring. One thing I miss from these stories was the maturation and use of Lando Calrissian who is shown on the first cover for this mini-series. He isn't just a background character in the Thrawn Trilogy, he is an integral member of the original trilogy characters, just as important to the stories as Han Solo, Princess Leia, Luke Skywalker, or Chewbacca. It is unfortunate he did not make an appearance in The Force Awakens and I'm happy to hear he will be appearing in the upcoming Han Solo movie. 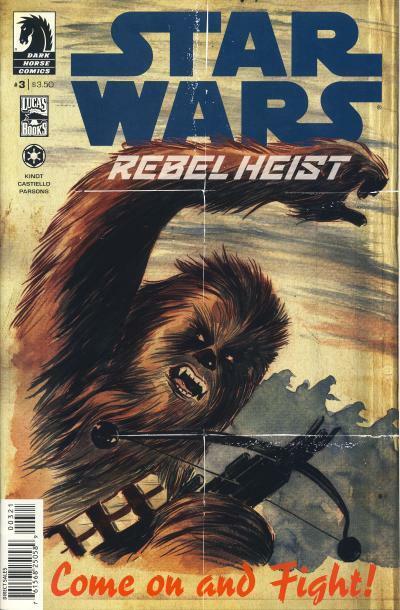 Each issue of Star Wars: Rebel Heist tells a story of one of the main Star Wars heroes from the point of view of a Rebel recruit. Star Wars: Rebel Heist #2 focuses on Princess Leia. A variant sketch cover was also published. 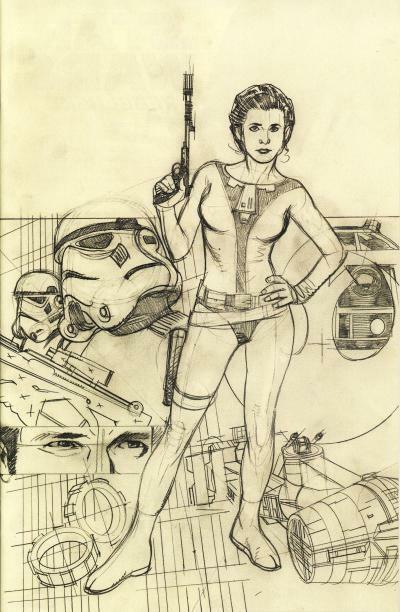 The sketch and standard cover have Princess Leia dressed in different clothing. 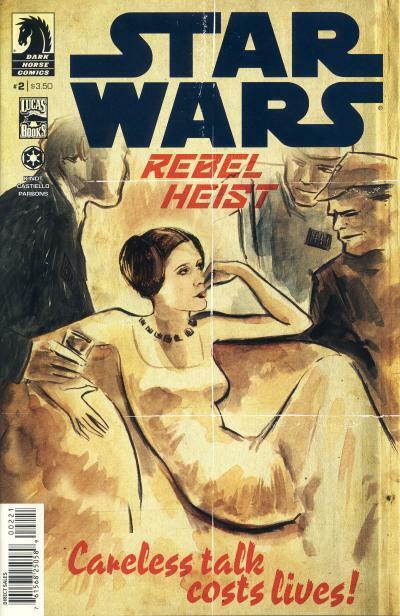 The sketch cover, which would have been drawn first, shows Leia in a jumpsuit with some black highlights. Her holster is strapped low around her waste and also to her leg. It appears that cover artist Adam Hughes might have been given a preliminary design of her outfit to draw the cover from. On the standard cover, her outfit now has a high collar, a long flowing cape, and is all white. Her holster hangs down in the front and is not attached to her leg. She also has an electronics device attached to one wrist. Princess Leia on the cover more closely matches her look inside, except for a few details. Inside, she is wearing her hair in buns like in A New Hope. Additionally, her holster, belt, and cape are colored grey. Both designs are inspired by the white outfit her mother, Padme Amidala, wore in Attack of the Clones including the cape. 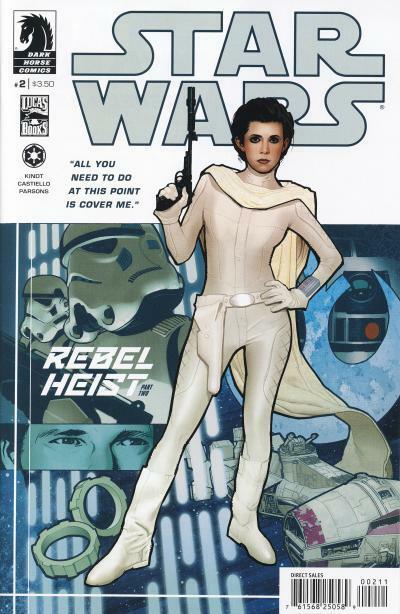 Leia wears another slight variation of this outfit in the Rebel Jail story arc in Marvel's Star Wars #16 - 19. Matt Kindt is an American comic book creator best known for his work on MIND MGMT from Dark Horse as well as writing several titles for Valiant Entertainment including: Unity, Rai, Divinity, and the 2017 X-O Manowar. His art style is unique for comics; he works with watercolors and his character designs tend to be cartoonish. His artwork looks like a cross between a children's book and fashion design sketches. 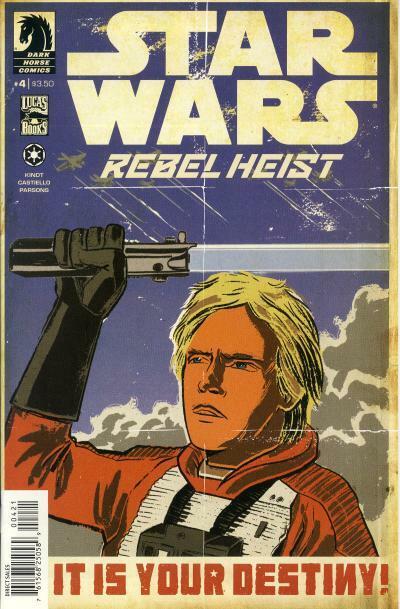 Matt Kindt's art is not someone you would expect to see on a Star Wars comic book, but Dark Horse hired Kindt to write the Star Wars: Rebel Heist 4-issue mini-series. In addition, Kindt drew variant covers that play to Kindt's strength; they are designed as Rebel propaganda posters which are based on World War II posters. The first propaganda poster cover shows Han Solo receiving a medal. 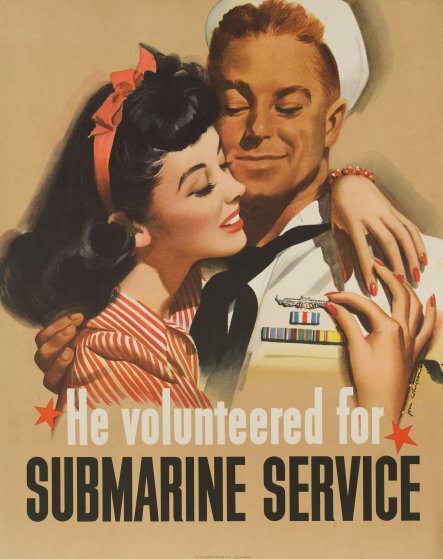 This cover is based on the He Volunteered for Submarine Service World War II poster. The second propaganda poster cover shows Princess Leia reclined on a chair with Imperial Officers surrounding her. This cover is based on a World War II poster by Gerald Lacoste from 1942. The Chewbacca Come on and Fight! 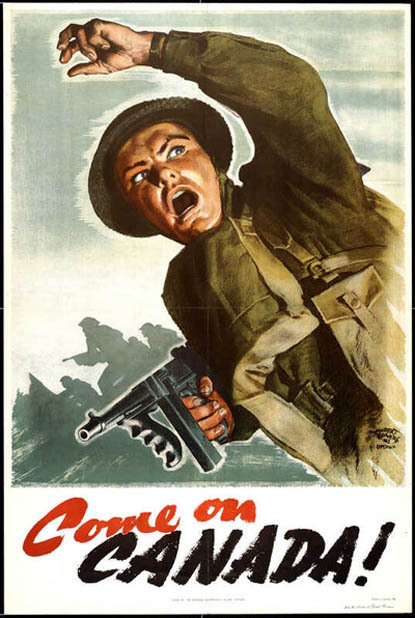 propaganda poster cover is based on the Come on Canada! 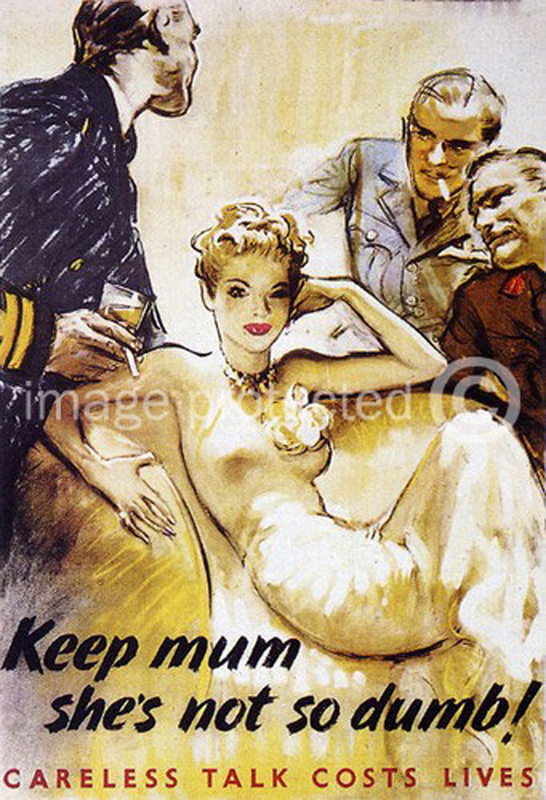 World War II poster by Hubert Rogers. The final cover shows Luke Skywalker holding up his lightsaber while X-Wings fly over head. 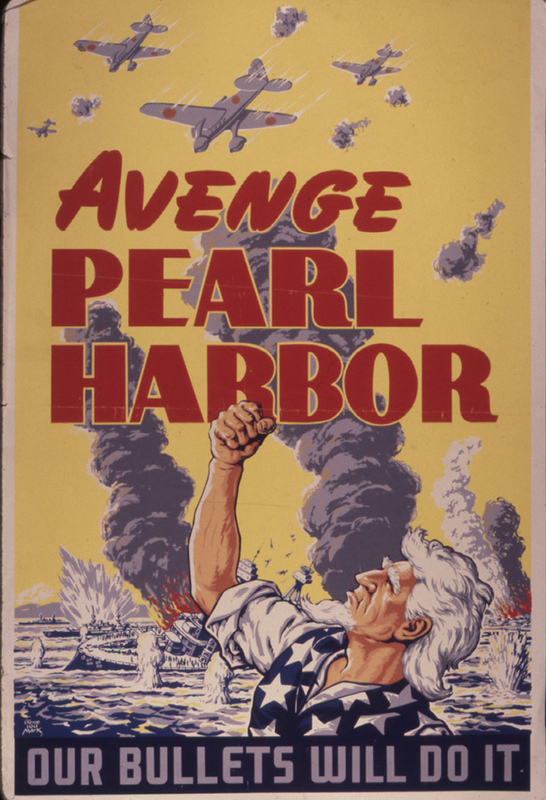 It looks somewhat like the Avenge Pearl Harbor World War II poster. I was unable to find the exact World War II poster that inspired this cover. Matt Kindt's art style is definitely not a style I would appreciate on the interior of a Star Wars comic. On the other hand, his artwork for these propaganda posters are nice and I especially enjoy the covers for issue #1 - 3. I don't particularly like the cover for issue #4, but maybe I would have a better appreciation of it if I saw the source poster it was inspired from. Luke looks stiff and it is hard to understand what emotion his expression is conveying. 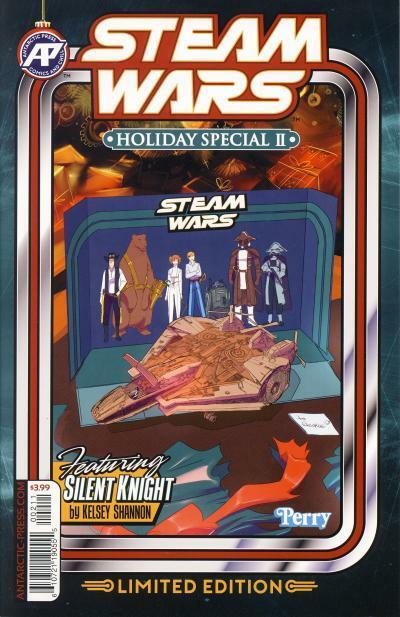 Steam Wars: Holiday Special #2 continues the tradition of the previous special by mixing original Kenner packaging dressing with other Star Wars-like imagery. 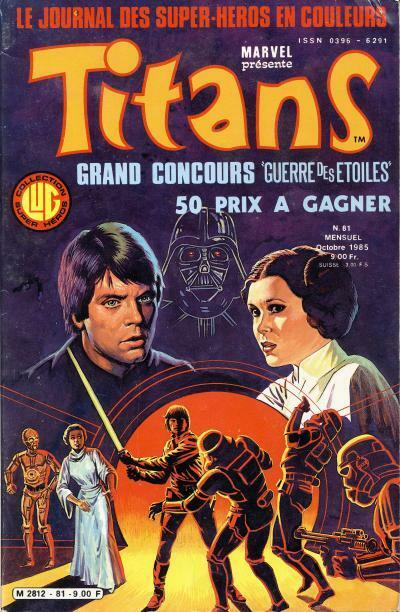 Like it's predecessor, the cover is laid out as a vintage Kenner Star Wars action figure package with the silver bands although the solid black background has been replaced by black and green. The character placard under the title says Holiday Special II and Fred Perry's "signature" is done in the style of the Kenner logo. The art inside the cover dressing are some Steam Wars toys near a Christmas tree. The spaceship is inspired by the Millennium Falcon. The spaceship is sitting on a Steam Wars version of the Star Wars early bird display stand. The original Star Wars title has distinct eras delineated by the movie adaptations. The title after The Empire Strikes Back would see a change in writers as well as artists that substantially alters the tone and stories told, but this did not occur immediately. 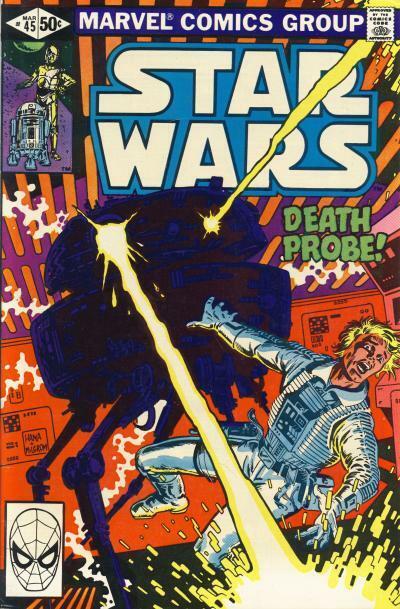 Archie Goodwin, the writer for most of the Star Wars issues after Roy Thomas' final issue #10, contributed three more stories immediately after the movie adaptation, issues #45, 47, and 50, and also wrote issue #98. Carmine Infantino provided the artwork for the four issues immediately after the adaptation, issues #45 - 48, as well as issues #53 and 54. Archie Goodwin had wrapped up the various story arcs he was telling before The Empire Strikes Back and only issue #50 references a character he introduced in that run, Domino Tagge. Issues #45, 47, and 50 offer a glimpse of what a post-The Empire Strikes Back title might have looked like if Goodwin had remained on the title. Luke Skywalker: "It felt like Vader told me the truth... but wouldn't that mean Ben Kenobi misled me? Either seems unthinkable - makes it so hard to decide what I should do next and --"
Luke Skywalker: "Yoda said it, Artoo, there is no try...! Only do... or do not! And I mean to do!" The entire story concerns Luke's battle with a specially augmented Imperial Probe Droid, designated 13-K, that takes over a Rebel Blockade Runner and kills all aboard. Luke is flying his X-Wing on patrol when he is fired upon by the Blockade Runner under the control of the droid. His X-Wing is destroyed, but not before he and R2-D2 eject from the craft. He boards the Blockade Runner and soon learns the Probe Droid has taken over. Luke also learns the droid is set to blow up the ship when it rejoins the Rebel fleet. The Probe Droid is in communication with an Imperial Navy Admiral, Damon Krell, who commands a Star Destroyer. Krell is your stereotypical arrogant Imperial officer who oversaw the enhancements to the Probe Droid. The Rebel fleet becomes aware of a problem with the Runner and attack the ship. Luke manages to sever the communications between the Probe Droid and the Imperial Star Destroyer and he and Artoo eject from the Runner in an escape pod. The Probe Droid takes the ship into hyperspace, intent on returning to its base, the Star Destroyer led by Admiral Krell. Exiting hyperspace, the Blockade Runner nears the Imperials and the ship explodes, taking the Destroyer with it. The cover is not done by Carmine Infantino, which is a shame. The Imperial Probe Droid inside the story has a bulkier body and a smaller head making it more ominous where the droid on the cover looks more movie accurate. Another problem with the cover is Luke is wearing a white flight suit, but inside the story he is wearing the familiar orange jumpsuit. The cover is decent, but it would have been nice to see an Infantino designed layout. In the story, Luke uses a lightsaber. In fact, Luke continues to use a lightsaber in subsequent issues and it is never explained how he has the saber, since his was lost along with his hand, during his confrontation with Vader in Cloud City. Nothing in the Star Wars #45 requires Luke to use a lightsaber since Luke is equally adept at using a blaster. I've just requested my third return of a Star Wars comic book in just as many years from the Books-A-Million (BAM) online site. The first time I needed to return a comic was back in 2015; it had arrived in an over-sized box with no packing material whatsoever to secure it. The comic spent its journey bouncing around inside the box on a trip from Alabama to Arizona. Needless to say, all four corners of the book had issues. 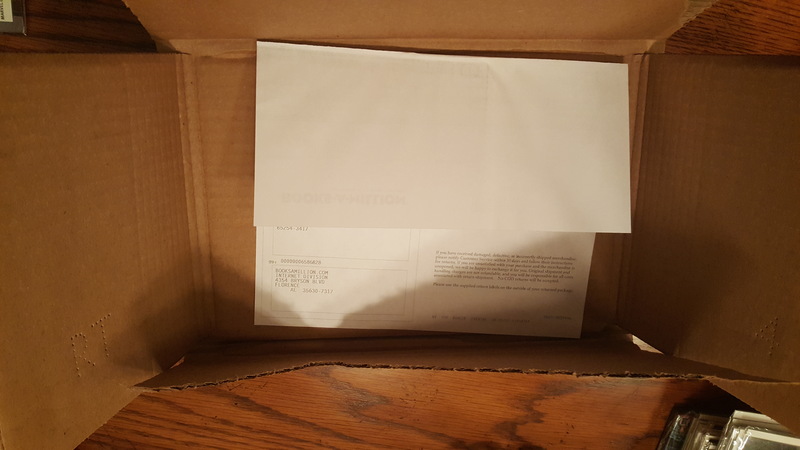 The second time I returned a comic was in 2016, it wasn't because of an over-sized box, but an under-sized box. 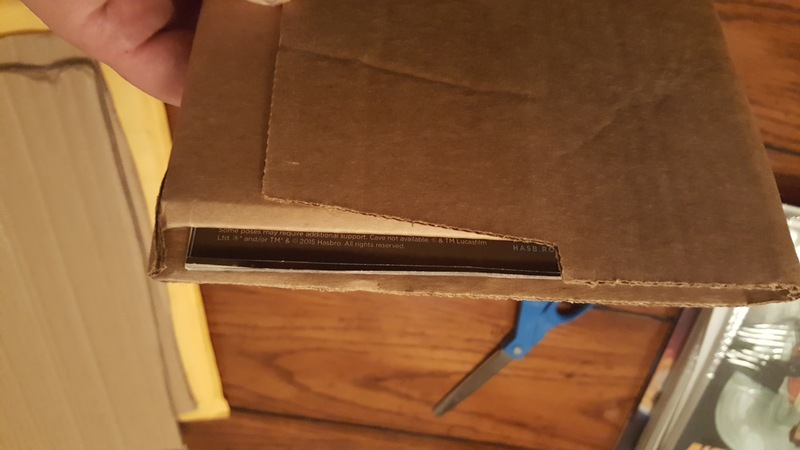 The box length was shorter than the comic and whoever packed it pushed the comic into the box anyway. And they used paper to protect the content from jostling inside the box despite the fact the comic was wedge into place. 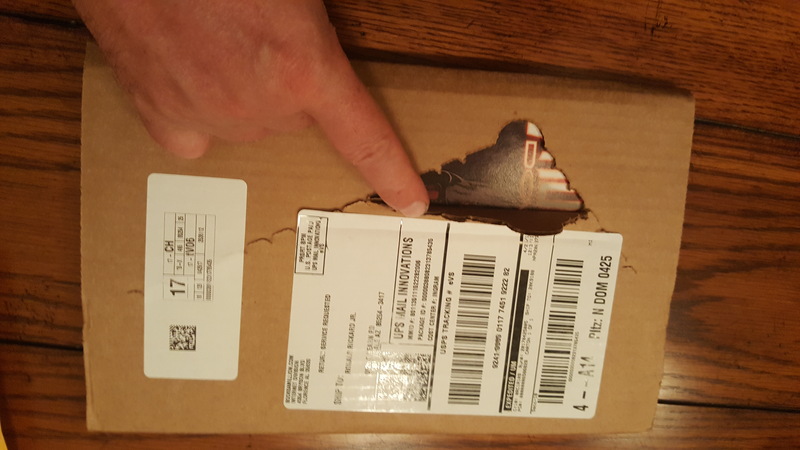 This comic didn't even need the help of the postal service to arrive damaged, it was damaged by the BAM employee who packaged it. Today's return was yet another twist on how to damage a comic book. This time, the comic was put into a book mailer, the perfect packaging needed to secure a comic book. These mailers are great, when used properly. But rather than placing the comic inside the area designed for the book, it was placed between the top label flap and the inner flaps. The end result, the comic was sticking out of the mailer on its journey from Alabama to Arizona. 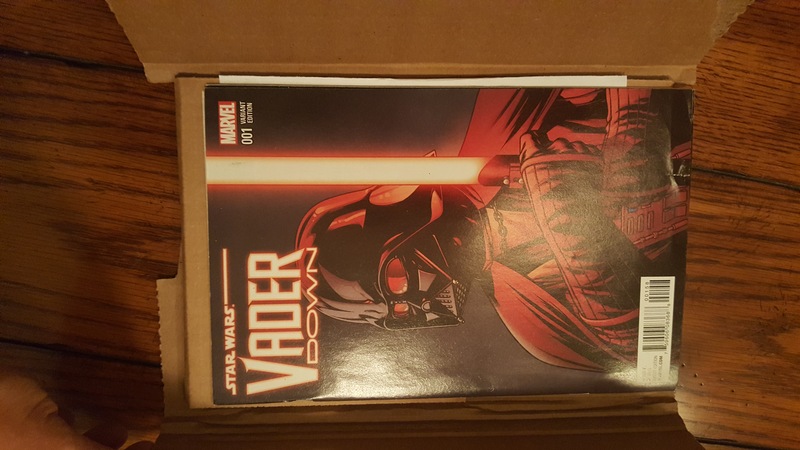 The Star Wars comic is sticking out of the unopened mailer! The comic is between the top label flap and the inner flaps. 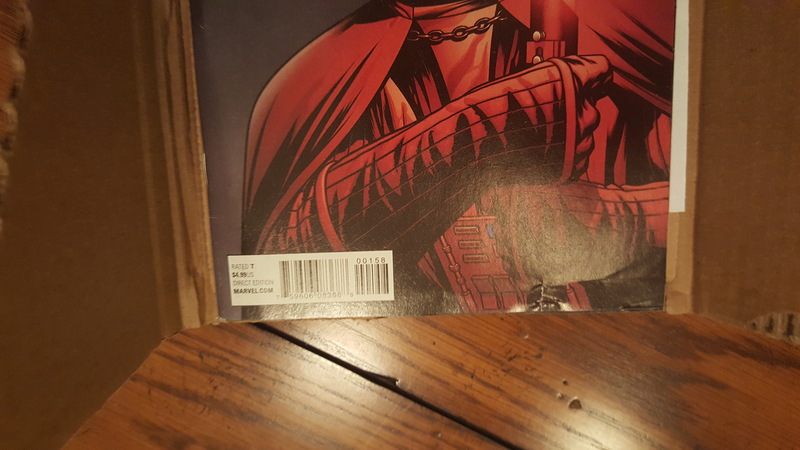 The comic is sitting on the inner flaps instead of being secured in the area below the flaps. As expected, the comic is damaged. But at least half of the package invoice was protected! What makes the whole thing frustrating to me is BAM keeps getting exclusives and I can only guess, based on my experience, 10 - 20% of the comics they ship out are damaged due to negligence. Clearly, the corporation wants to sell these because their offerings have increased over the years. And they must be aware of the damage issue, because they have upgraded to book mailers designed to protect the contents from damage. What the organization doesn't know however is an employee can still use the mailer and damage the book. I refuse to believe this was anything but spiteful, not aimed at me per se, but definitely a disgruntled worker who probably packed one too many single comics for shipment that day. To be honest, I'm on the employee's side! I'd rather not order retailer exclusives and have them mailed one or two books at a time. It costs more because I have to pay for shipping and handling without the ability to combine the order and the odds of a mishap in shipment goes up with more packages. But what choice does a collector have in today's market? Marvel loves to put out new #1s frequently, so they can entice retailers to want to offer an exclusive. I took the pictures above in the hopes of showing an employee at BAM the problem, but unfortunately their system rejected my email because of the attachments. So the best I could do was try to explain the problem without the benefit of the images. I am sure whoever is on the receiving end of these emails doesn't care; I'm just another picky comic book customer to them. Hey, I got the comic, why am I complaining? Never mind the fact that I paid twice the cost of the book if it wasn't for the exclusive cover. And being a collector, condition does matter! If it was just this one incident this week, I doubt I would be writing this editorial. But earlier in the week, I also received my monthly shipment of comics from Discount Comic Book Service (DCBS.) For the third time I received damaged comics. I order comics from Books-A-Million about two or three times a year and I have order my comics from DCBS monthly for over eight years, so trust me when I tell you DCBS has a much better track record. The DCBS shipment included 28 comics all packed into a brick. On one side of the brick, the comics were badly bent from top to bottom, damaging the spine of three comics badly. And the brick was dropped on a corner prior to shipment, damaging the corner of another four comics. I emailed DCBS support and in two days they responded saying they will order replacements for all seven comics and I didn't need to ship back the damaged ones. Now that is service! Corporations like BAM are not purposely trying to make life hard for comic collectors; in fact, they apparently want us as customers, otherwise why offer the exclusives? The ambivalence comes into play though with the systems they have in place for customers to provide feedback on problems. BAM wants us as customers, but they don't really have a system to see if our needs are being met. Obviously BAM feels it is better to just have the books returned without truly understanding why, whereas DCBS is more invested in making their customers happy. BAM is huge and they make up for the few unhappy customers with volume, where DCBS is undoubtedly smaller and wants to work at keeping their customers happy. In the end, both retail companies are necessary to comic collectors like me who want the exclusives along with the retailer editions, it's just that one does a better job of catering to the collector than the other. Darth Maul #1 debut to impressive numbers, taking the top spot in February. Marvel has announced Darth Maul #1 and 2 are going back to print. The 2nd prints are scheduled to be in stores May 31st. 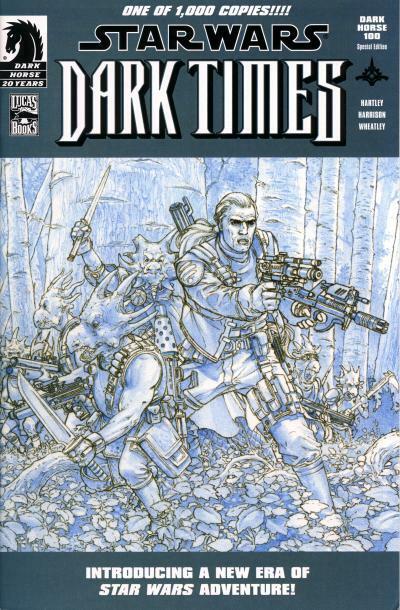 Starting in 2006, Dark Horse ran a program that allowed ten comic retailers to receive 100 copies of a variant cover. The variants were used to promote issues that Dark Horse wanted to receive additional attention. The first comic to receive a Dark Horse 100 variant cover is Star Wars: Dark Times #1. Other Dark Horse properties besides Star Wars are included in the promotion including Buffy the Vampire Slayer, Conan, The Goon, The Terminator, and others. 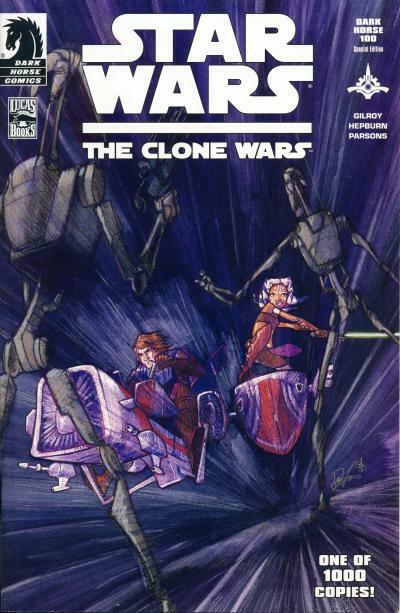 The next Star Wars comic is Star Wars: The Clone Wars #1. 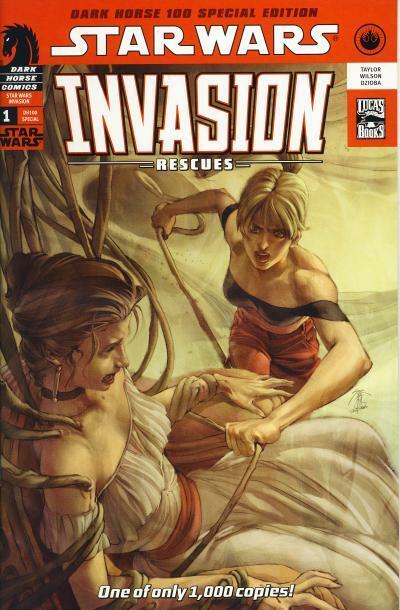 The final Star Wars comic to receive a Dark Horse 100 variant cover is Star Wars: Invasion - Rescues #1. The variants for these three comics are limited to 1,000 copies which is obvious from a blurb on the covers.